17, Agbagbon Close off Ologun Agbaje Street, off Adeola Odeku, Victoria Island. For a unique feel of fun, leisure and shopping, guests who lodge at Integrity Hotel and Suites can visit the Palms shopping mall which is close to the hotel. Guests at Integrity Hotel and Suites would enjoy top class amenities and excellent customer services at pocket-friendly prices. It is located at 17, Agbagbon Close, Off Ologun Agbaje Street, Adeola Odeku, Victoria Island, Lagos. 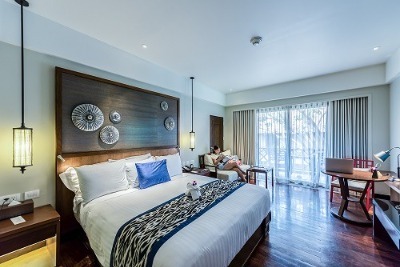 Each room is designed with architectural art and is fitted with an air conditioner, a king-sized bed, bedside lamps and a flat screen TV with cable reception. The rooms are fitted with en-suite bathrooms. The room categories offered by Integrity Hotel and Suites include Standard Executive, Deluxe and Executive Deluxe. Guests can have workout sessions at the gym facility provided by Integrity Hotel and Suites. A swimming pool is available for guests interested in swimming sessions. Guests can make use of the conferencing facility to hold training, presentations and seminars. Large social and corporate gatherings can be held at the event hall. Spa and beauty services can be gotten at the fitness centre. A business centre is available to guests in need of photocopying and printing services. There is a barbecue for guests interested in grilled fish and steak. A Wi-Fi facility has been provided for a free and fast internet access. Integrity Hotel and Suites has a restaurant that offers buffet options to guests. The bar is filled with exotic drinks for guests to enjoy. Integrity Hotel and Suites renders 24 hours front desk, airport shuttle and luggage storage services. There is free parking space in the hotel. A constant power supply is enjoyed by guests. the premises are guarded by security personnel. Q: Does Integrity Hotel and Suites have cribs? A: Cribs are not available. Q: Is there a pool at Integrity Hotel and Suites? A: An outdoor pool has been provided. Q: Does Integrity Hotel and Suites have a gym? A: There is a gym facility for working out. Q: Is there a spa at Integrity Hotel and Suites? A: A spa is available for beauty and massage sessions. Q: Does Integrity Hotel and Suites have a bar? A: A bar is available. Integrity Hotel and Suites is a budget hotel in Victoria Island, Lagos. My stay was very fine, the receptionist was very jovial, smiled at guests and was very professional. The room was well decorated and power was on, for 24 hours all through my stay. The food was also very nice. The environment was equally clean. One amazing thing about the place is the fact that there was twenty four hours power supply. I liked the environment. The staff were nice and friendly. The rooms were well cleaned and I enjoyed the food served to me. Nice place! The hotel is a nice place to stay. The environment is nice and cool. The staff there are very nice and friendly, also very efficient in the discharge of their duties. The facilities there functioned properly and there was stable and constant power supply available. Have nice pictures of Integrity Hotel and Suites?